Tags: EPT, high roller, Sam Greenwood. Posted on Monday, April 30, 2018 by "T". The year 2018 is definitely an incredible one when it comes to the live tournament circuit for the likes of poker pro Sam Greenwood, as he has managed to get four 7-figure live tourney scores in his career, and three of them have just come in the past 6 months! The most current big payday for the Canadian poker pro came from the 2018 European Poker Tour Monte Carlo €100,000 Buy-in No-Limit Hold'em Super High Roller. He outlasted a field of 46 players in this event to win a nice sum of €1,520,000 (approx. US$1,840,000). There is really no stopping Sam Greenwood! Two weeks earlier, he won the 2018 partypoker LIVE MILLIONS Grand Final Barcelona €50k Super High Roller for €1 million, and then just a week ago, he won the WPT Amsterdam High Roller for €125,785. Now, he has a total of $4,015,094 winnings to his name. In this event, Greenwood clashed with Christoph Vogelsang in a heads-up match with just a 2-to-1 lead. The battle lasted for over two hours, and it was Greenwood who finally won. Vogelsang won €1,046,000 as the runner-up, and this prize amount is his third biggest career score. Now the German poker pro has over $16.8 million in lifetime tournament earnings. 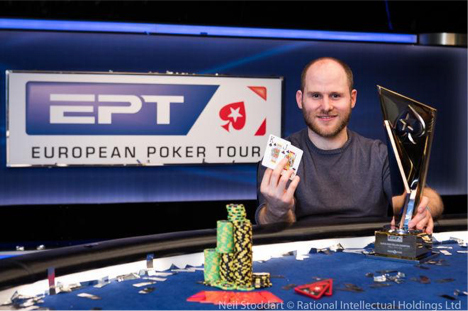 EPT: Steve O'Dwyer Wins Yet Another High Roller Title! 11 comments for "EPT Monte Carlo €100k SHR won by Sam Greenwood for €1,520,000"
This man is in a form of great days. 3 prizes exceeding one million dollars in the last 6 months it's clear that this man has a great talent with professional poker. I'm sure there are plenty of envy who played with him at the table but you have to admit it the value of this Sam Greenwood. You do something wrong - not ponying up 100k buy-ins for events like this. Where is your life going, man? Very very big achievement from Sam there, to beat this small field of 46 players is not something easy. A 5k event at the wsop might be even easier that this one. Congrats Mr Greenwood. In six months, scored three times huge. Massive well done to Sam Greenwood for winning the €100,000 buy-in super high roller event and scooping up the first-place prize of €1,520,000. Congratulations also to Christoph Vogelsang on his runner-up finish. I will be sure to watch tournament replay when it becomes available online.